For many of us, the Spring and Summer seasons are particularly busy - with graduations, weddings, outdoor activities, and gardening projects. We treasure the mild temperatures and even the rainy days - as the windows are open and the birds are chirping. Since the last trade show, I have been hard at work and have sent three new designs to my finisher, and have located an antique frame for the fourth larger design. Pictured here is just a sneak peek of the little Alphabet Owls - stitched over one and two threads. Designing is such an interesting process as we are always thinking ahead to the next step. Of course, charting is the first step, then selecting the colors of the fabrics and fibers, then stitching the model, and finally selecting a finishing method. Finishing is the key to having a design that appeals to our stitchers and makes them want to purchase the pattern! 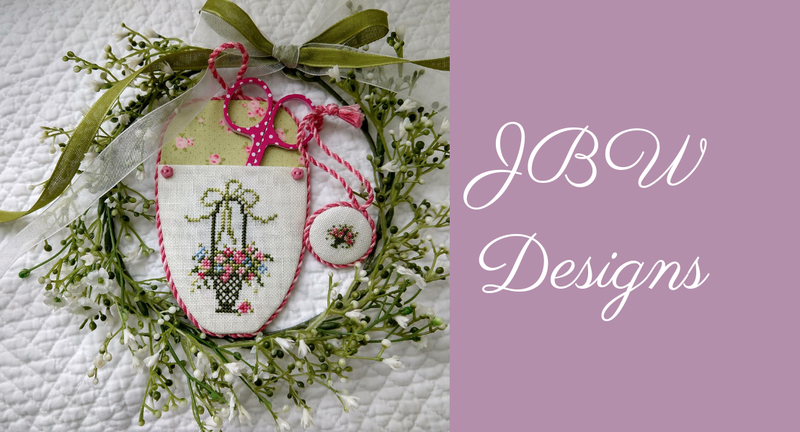 On a side note, I invite you to peruse my Etsy Shop, JBWDesignsXStitch, where you will find several out of print titles for sale (limited quantities) as well as older models. We strive to add new items each week, so check back often to see new listings. In closing, it is my goal to release the new titles in mid-August - so stay tuned and keep stitching!